Glide silently on Nuuksio Hawk Lake waters and observe the beauty of natural forest, rocky shores and dark water. Fill your lungs with fresh air on a guided hike following the marked trails of Nuuksio National Park. This guided trip is absolutely stunning! The Nuuksio Canoe & Hike Adventure starts with a canoeing session on the peaceful Hawk Lake. Your paddling trip is sheltered from winds by the steep slopes and rocks surrounding the lake. Our canoes are stable, and each can fit two people. At the start of your canoe tour your guide will introduce to you the basics of this calm and tranquil way of moving along the waterways of wild nature. At the other end of this small lake you will climb up the steep hillside and enjoy the great views over the National Park. Relax and enjoy the natural environment of this typical lake in Nuuksio National Park. After a short break you will be guided into the lush green forests of the National Park. On this guided walk following the marked trails you will have the chance to enjoy the beautiful natural environment on a easy pace. On half way of the tour a delicious sandwich and a hot drink are waiting for you by the lakeside. The Hawk Lake is very small, so the paddling distance is not long. The length of the guided hike is about 5 km, the pace is easy and suits everyone. This tour is more about enjoying the nature than covering long distances or excercising hard. 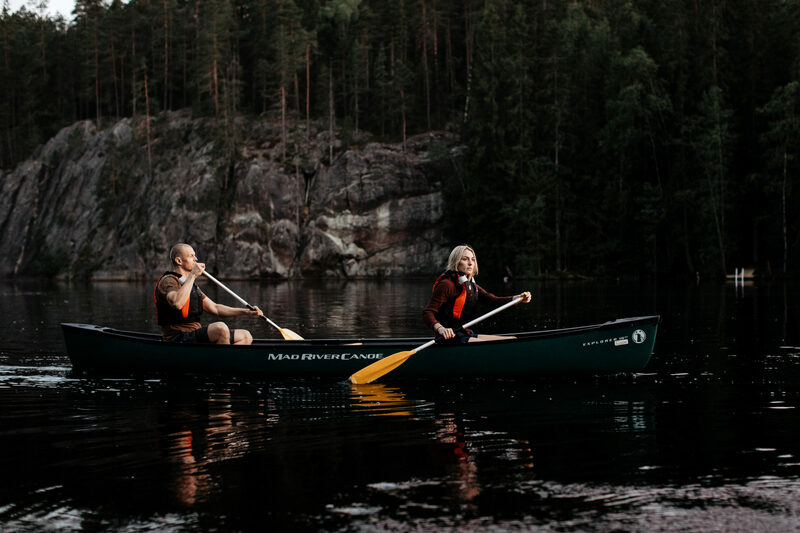 The Nuuksio Canoe and Hike Adventure includes transport back and forth from downtown Helsinki. Pick-up: Kiasma Museum of Contemporary Art (bus stop), address Mannerheiminaukio 2, FI-00100 Helsinki. Departure at 10:30, back downtown at 15:00. Time: June 1 – August 31 every day. May and September every saturday and sunday. Level: No previous paddling or hiking experience required. Our canoes are stable and easy to paddle. Price includes: Transport from downtown Helsinki, guide, open canoe, paddle, life jacket, water bottle and snack.